The influence of investors in the private equity industry is growing significantly and has never been as strong as it is today. Join us as we explore the key findings of a worldwide research study investigating the current state of play in Private Equity fund governance. Using the main insights of the research as a backdrop, panellists provide a (post-AIFMD) reality check on the fundamentals of fund governance and operational due diligence, and discuss their views on the current and future state of fund governance in Europe. 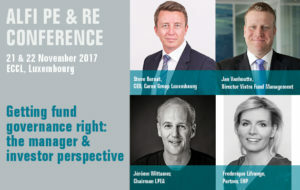 Don’t miss this roundtable discussion with governance specialists and the Luxembourg PE industry association at the ALFI PE & RE Conference on 21 November starting at 11:25am. View the list of speakers confirmed at the conference.